3D Make & Print is a comprehensive, inspiring manual for one of the most exciting fields of modern technology – 3D printing. With this stunning new publication from the makers of 3D Artist, you'll learn how to pick and prepare a new 3D printer, how to use and maintain it, and how to create your own 3D models that are perfect for printing. You'll make models with moving parts, realistic replicas … of film and game props, you'll master the best finishing techniques for your prints and learn all about the kinds of filaments you can print with. Not only that, you'll also get a free library of ready-made prints with this publication so you can start printing today! 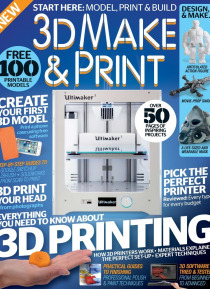 Featuring: Get Started With 3D Printing – Everything you need to know about modelling and printing in 3D. Life-saving 3D prints – Discover how 3D printing is helping the medical industry. Make a Troll slayer sword – Look like a badass at the next con you go to! 3D-Print From Scanned Photos – Make lifelike models and print out real people.